Do you want to see clock in full with seconds and year? Do you not have it at Ubuntu 17.10 and 18.04? Do you have another GNU/Linux distro (GNOME 3.26+) with same problem? What you need to do is to install Datetime Format extension and a little setting. 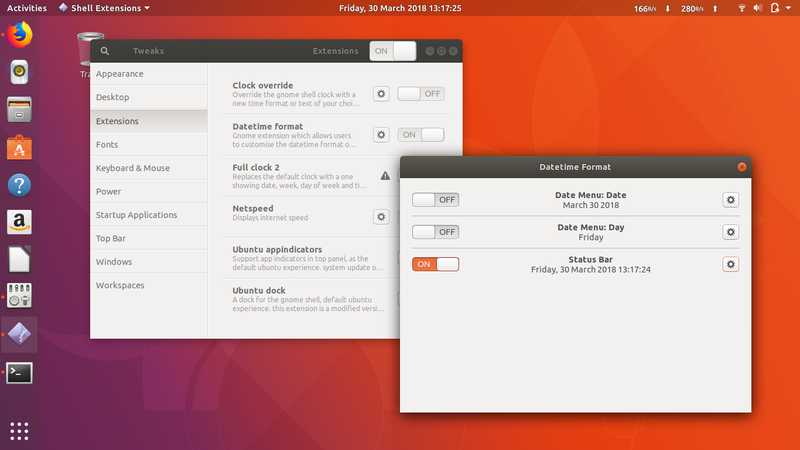 This extension is an awesome improvement by Dan-K to control GNOME top panel's clock as you wish. The instruction do set it is explained below. Install Datetime Format extension from the website https://extensions.gnome.org/extension/1173/datetime-format. If you do not know how, simply follow instruction here. The name is GNOME Tweaks on Ubuntu Software. Go to GNOME Tweaks > Extensions > Datetime Format > click 'the gear' button > a small dialog appears > turn ON the Status Bar option > click 'the gear' button. If the clock on the top panel doesn't change immediately, simply restart your computer. You should find your top panel shows complete clock like below. Happy working!